Boston Hassle’s Black Market Flea will be this Sunday 4/14 from 12-6pm in the Cambridge Community Center. Read all about our awesome vendors before you go. 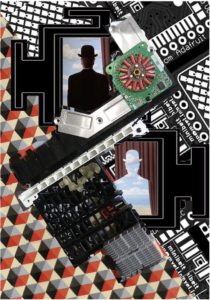 1.I’ve seen gears and clocks in your work, as well as computer parts, is there a limit to the material you use in your pieces? Yes, it is limited to electronics, except for the occasional bike gear or copper gear. The parts I use in my work are the ones I think are the most beautiful and interesting. I take apart anything I get. Including parts from printers, scanners, car radios, cameras, a grandmother clock I found on the side of the road. Printers have lots of plastic gears. So there’s a lot to work with. I am part of a community that includes engineers working on robotics, electronics, building prototypes and inventing new technology. They often have surplus parts as do folks next door at Greentown Labs. I have some special sources who KNOW the sort of things I love. 2.Could you explain to me briefly about the process of finding and deciding on what materials will be best for a piece or a series? When I take something apart, I save the parts I like and take the other 95% to be recycled. I organize the parts I love, into bins, boxes, plastic sorting trays. I sort and store them by their characteristics, black plastic, white plastic, copper, silver metal, tiny things, big things, flat things to put on surfaces. My paper sorting system is by color and black and white. I started off using old letters, postcards that were from my past (and my family’s). Now when I find an image, pattern or segment I like, I scan it and work with it in Photoshop. I get them printed at the copy store on their fancy color printers. I still have a bucket of old original stuff I can always go back to if I want. 3. If you could provide a picture of a specific piece you plan on displaying/selling at Black Market Flea, could tell us a little bit about it? This piece is like a jumbled up mandala. Magritte’s man in the bowler hat is integrated into a chaotic but orderly mix of shapes and patterns. Blocks, cubes, lines, grids and plaids appear on many levels. Cut out squares and lines appear on the diagonal plastic printer parts. The pattern on the silver heatsink can be seen in the enlarged circuit board pattern. The pieces fit together like a puzzle that is fun to explore. 4.What inspiration do you pull from for each piece? I like to bring together 2D line and color with 3D shape and contour, growing out of my love of the abstract modernism which was my focus as an Art History student. My aesthetic developed while attending SUNY Purchase and spending a year at The American College in Paris/Parson’s School of Design. 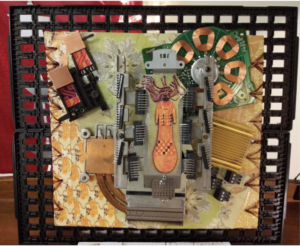 You could say my original discovery of the visual similarity between ewaste and abstraction has grown and developed over time. Each piece tells a story. 5. Finally, what’s next for Hacker Creations? I’m working on a commission using a new way of building out from a flat surface, so that it can hold up the parts in different ways, giving the work supercharged dimension. I’ve been working on making large scale work because there has been some interest from Tech company’s for office decor. I’ve had an Etsy shop for years which is in need of attention and I’m going to start listing my work on https://saatchiart.com. I will be applying for grants, open calls and looking for my audience. That is why I love doing Boston Hassle events! 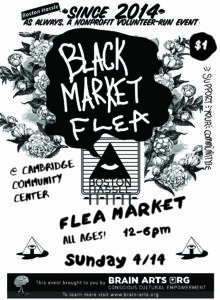 Once again folks, Black Market Flea is this Sunday 4/12 from 12-6pm, at the Cambridge Community center. See you there!